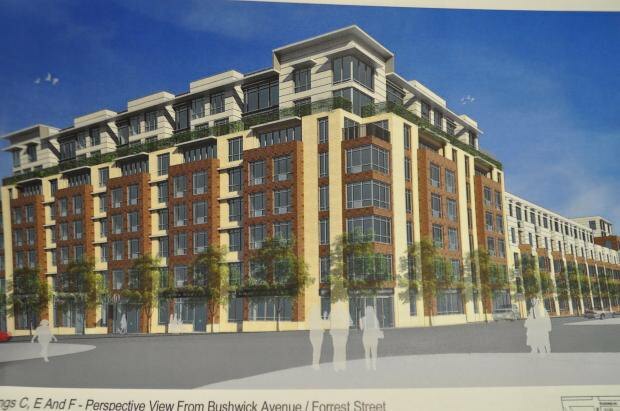 It seems that development plans at the Rheingold Brewery site in Bushwick are one step closer to the completion. We are experiencing turbulent times in Bushwick. The gentrification of the neighborhood is mercilessly progressing, and while most of the time it seems that we are just puppets in this play, this past Monday Bushwick residents had the right to have their voices heard regarding the quickly progressing rezoning of the former Rheingold Brewery. However, the members of Community Board 4 decided to take this right away against the law. The development plans at the Rheingold Brewery site in Bushwick are one step closer to the completion. This past Monday, July 29, Community Board 4 voted and approved the proposal to rezone sections of the site from M-1 to R-6 and from M-3 to M-1. "It was an emotional meeting because everyone present recognized that Bushwick will be changed profoundly by this development, but most saw it as a chance we could not turn down," Deborah Brown, Community Board 4 member wrote us in an email. Undoubtedly, this development will have far-reaching consequences for Bushwick as we know it today, and it is for this reason that the NY State law, which gives the public a right to be present at the community board meetings and to voice their concerns, should have been observed. In late June, Community Board 4 held a meeting and a public hearing about the proposed rezoning of the Rheingold Brewery site. Community Board 4 voted to delay their vote on the proposal because “they wanted to hear from other city planners about their options,” Nadine Whitted, a CB 4 district manager, told us today. CB 4 met to vote on the proposal this past Monday in a meeting outside of their regularly scheduled third Wednesday of the month (with the exception of July and August) because the ULURP rules require that they submit their recommendation sixty days after receiving a complete application. Deborah Brown kindly informed us about this meeting, which we posted here on Bushwick Daily, encouraging our readers to go to the meeting and voice their opinions. On the same day, Deborah Brown emailed us again to inform us that the Community Board meeting was not actually public: “turns out that this is NOT a public meeting after all. It's only for elected officials and CB #4 members,” her email said. We updated the article, which was followed by comments from our puzzled readers who wondered if this is a standard procedure. Nadine Whitted confirmed today that the Monday CB 4 meeting was closed to the public because “it was only a vote and public hearing already took place in June.” According to Deborah Brown, as well as Nadine Whitted, CB 4 members quietly met with representatives from the Brooklyn Borough President's Office and the NYC Department of City Planning, as well as with representatives of the developer, Read Property Group, and heard their presentations. After these presentations, CB 4 voted and approved the proposal – without the public’s attendance. The Open Meetings Law does give Community Boards right to exclude public from their meetings but only in a very limited number of cases and for important reasons, such as public safety, etc. Monday’s CB 4 meeting was not one of these cases. So what happens now? “The Judge has the ability to invalidate such decision,” explained Robert Freeman. If somebody with interest went ahead and sued Community Board, indeed this procedural failure could cause the decision to be invalid, and likely would significantly delay the development of Rheingold Brewery. Yes, it was the faintest of rights because the community board rulings are only advisory to the city and matter very little in cases of lucrative developments, but it was the public's right and Community Board 4 decided to take it away. We would like to stress again: This is where the changes to the neighborhood happen and the residents should be part of important decisions. While the Community Board members are volunteers, at least the elected officials should know the procedural rules and make sure that the people they represent are given the opportunity to exercise their rights in this democratic society.